Hey guys, I'm a 31 year old who played highschool and last year started playing adult league ball. I have a couple of habits I think are bad and things I'm trying to correct to help keep my arm healthy. Last year I would get really sore for the whole week and would sometimes not be able to pitch again, but I didn't have any good routines for off days to help. Day 1(after start)- squats, lunges, dead lift, core, 30 min cardio, no throwing at all. Day 2 - Chest, triceps workouts, 30 min cardio, warm up throwing 10 minutes, flat ground throwing and mechanic walk through in the mirror. After I started this it seems that I can get over the soreness and feel 90 percent ready to pitch by about day 5 right before rest and I feel ready to go by the game day. Despite this I feel that my mechanics can be improved to help not put as much stress on my elbow perhaps. I have a few velocity killing tendencies in my mechanics that I’m aware of as well. What I think I need to fix is I have a pretty decent lean over my glove side on rotation, I’ve heard this can add excess stress on the elbow. Other things I’m wanting to work on that aren’t necessarily regarding the elbow is to stand taller and not hunch when I bring my kick leg up, increase stride length, and definitely increase hip-shoulder separation because I don’t feel I have any. Also I sometimes have an arm recoil after the pitch. Let me know what else you see or what you think about the things I’d like to fix, or also feel free to add any comments about my routine or anything. Also any exercises to help transition into better mechanics. I’m just trying to stay healthy as long as I can, just watched a guy fully rupture his biceps tendon mid pitch and it really didn’t look fun. First video is a from behind the plate which goes through all my pitches. Second video I added just has 2 pitches, it’s older and I feel my mechanics have changed a little already but thought the angle would be good. And yes, first pitch of the inning crushed. lol. Thanks ahead of time! I appreciate all input. Casey, I’m not a mechanics coach, but, I do notice that you tail off the mound and give up a lot of your stuff. So, below I took some pictures of your choreography on the mound and perhaps you can address these things. In (1) you load up on your back hip/leg, but remain in that loaded up position. in (2) you remain in that load position and give up a lot of downward thrust, also, sitting a bit off balance. In (3) your downward travel towards your stride foot planting, find your entire body still in the sitting position. In (4) “loading” is following you down and forward - thus taking away a lot of your drive and forward motion. In (5) your entire body is stuck with the “loading” from (1) and you Peter Pan off the mound, instead of driving forward. So, as I see it, once you decided to “load up”, aggressively drive forward, keeping the back of your head more in line with the heel of your pivot foot. Tuck that leg kick in more, and straighten that pivot leg out as you begin your drive down the mound. Bring that glove up more - just a bit, to your glove side rib. Concentrate on getting out of that swivel and swing off the mound and drive forward more. So, keep in mind that you’re 31, and not 18 again. Your body isn’t in step with the things going on upstairs between the ears any more. Just take it easy and be more relaxed and glide more down the mound. Also, don’t be so stiff during your initial addressing the your battery mate. Ok Thank you!!! So let me just ask a couple questions to make sure I have this clear. I think I see what you’re saying and really all of my issues are lower body related. I’ve always had a really inflexible lower body, I have tight hips and lower back so I think in order to start fixing these issues I should start putting more emphasis on getting that whole area loosened up. In (1) you’re saying that I’m loading well but that back leg then needs to push myself forward and straighten back out correct? In (2) I’m still loaded, and my head is already off center towards my posterior, I want my head to be more over the pivot foot, keeping my balance more towards to front of my foot? Plus my front plant leg should be straightening here? In (3) At this point what I really should have is a much more extended back leg and I should have already rotated out of the sitting position. And I can also see that starting off balance in 2, I’m just falling even further in the wrong direction, correct? And really (4) and (5) are just the results of keeping loaded and not letting my lower body launch forward and straighten out correct? You said you would like my glove up more to the ribs? Do you mean in (3) and (4) when my glove is down by my hips? I’ve always struggled with that, I see pitchers with their arms up but somehow I have a hard time controlling my glove side. And then the only other question I have is the very last sentence you wrote. I didn’t understand what you meant. Thank you so much! I could always tell in my videos that my lower body is weird compared to other pitchers but couldn’t pinpoint the differences. To answer (1), (2), (3) - yes. My observations in )4) & (5), yes to your questions. In frames (2) through (4), your glove hand should extend then lag slightly with your front hip. 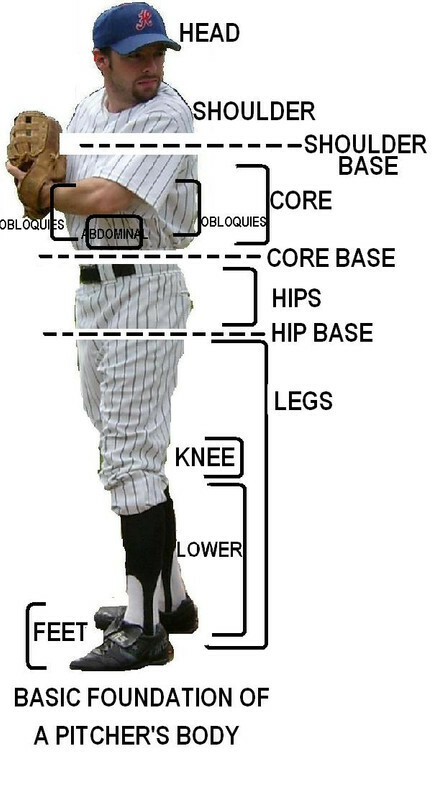 thus, your upper body being somewhat aligned with your hips - front hip leading, rear hip pointing slightly towards 2nd base. When your stride leg extends down the mound and is just ready to play, this hip and upper body posture will create torque for you upper body, to turn and deliver. Thus your body will pass on through this chain of events with a smoother flow of muscular power - from your legs, up to your hips. and finally to your core and shoulders. The end result will be a smoother flow of chorography, muscular transfer of strength and as an end result, will have your entire body iN on the pitch. Ok! Thank you so much. That is a lot of information to gather from just a couple videos so I really appreciate it. It’s hard to pick it all up by yourself so I definitely appreciate it. I’m pretty sure I know what to do with the lower body and I think I’ll be able to get that better. I’ll probably start on that first just because like everybody says the lower body is the foundation in which the rest of the body operates in the movement. Is there any drills or ways you know of to help train the body for the upper body alignment like you’re talking about with the glove side? And then one last question that I talked about in the first post. Am I looking for my shoulders to be horizontal or is some tilt to be expected still? Now that you pointed this out I see that a lot of my tilt comes from the off-balance start to my drive forward. I always just thought that being back on my heel more helped keep the strongest muscles in my leg and glutes stay engaged. And I figure that a good indicator (besides more video) that I’m making that correct adjustments on the lower body is that I’m finishing forward still on my plant leg rather than practically falling over sideways. Just about everyone wants a drill or something resembling a drill/exercise to accomplish some sort of improvement(s). There are, several and similar drills that address your question - BUT, here’s what I suggest. Your age and level of play will offer limited play - say once or twice a week at best. Your devotion to some sort of practice will compound your soreness and potential injury(s) if you’re not careful. I would also go as far as saying that life outside of baseball can and will demand a lot of your time, as whatever it is that you do requires your attention span(s). So, take my suggest and read and re-read, comprehend and absorb what I’m trying to get across here. I will be the first to admit that this media has it’s limitations - but, there’s enough here to warrant studying, and reasoning out the printed word. Take these suggestions step by step. Don’t give way to the urge to howitzer the ball. Practice on a level surface so you’re not fighting the subordination of either balance or comprehension of what you’re trying to accomplish. First work out your leg work. all your leg work. Feel the meaning of controlling your balance and your legs complimenting your drive forward - NOT SITTING TO DRIVE FORWARD. Second work with your hips as I suggested in my last post. Keep working with your hips as the end of a chain of movements - thus far, as your legs go through their muscle memory. Fourth with your glove arm/hands and your pitching arm, to take advantage of everything underneath, and accomplish that I suggested. Don’t come back in a few days or a week and say … " I got it!". As much as you’d like to think it… ain’t gonna happen. This stuff takes serious self discipline and study. You must tailor this stuff to your age, your body’s ability to bend, twist, and accept a very physically challenging demand(s). By the way, think of your body as built on platforms. Each section of your body depends and rests on the platform underneath it. One of the beautiful things about my situation right now is I’m a veteran from the Coast Guard going to school using the GI Bill. I do have a summer class right now but my schedule is pretty relaxed. If I want I can be at the gym for about 4 hours before i have any obligations for the day. Also, while I just started back at baseball last year, I have continually trained myself since I was 21. I am in way better overall shape than I ever was when I played baseball before. Your devotion to some sort of practice will compound your soreness and potential injury(s) if you’re not careful. What do you mean here? I understand over training is bad. What would you consider is over-training? I try to listen to the subtle cues my body gives me. Is there a max amount of days I should toss whatsoever? Right now its about 5 days a week 1 pitching, 2 flat ground work and 2 just normal catch. I tried out some flat ground work today for the first time since I did not pitch yesterday (rain out) and I can tell it’s a lot different. I’m looking forward to working on it some more. I have read your posts probably 2 dozen times already and have video from other pitchers on the team who execute their lower body like you say to. What is your opinion on compression sleeves? Are they ok to pitch with? It feels like it helps give a slight bit of support. The one I have is a very sturdy one that adds a fair amount of compression right at the elbow only (not losing circulation or anything like that). Amateurs in your age bracket normally have this " catching up" mindset that pushes them unrealistically to get back into the swing of things. Unlike your decision to “listen to your body,” many have no sense of reasonable per-game/post-game plans, other than self motivation, otherwise called devotion to a practice. However, you mentioned that you listen to your body and that you consider yourself in pretty good shape. A given, of course, is a stable diet and nutrition that has time released value. If you’re not sure to what I’m alluding to here, ask. Three (3) days in advance of an appearance, a lot of stretching and wind-sprints, Circulation exercises like windmills, trunk twists, walking leg squats and such. Go easy on the tossing and demands on the shoulders and arms. The day before an appearance, light tossing, no pitching. Concentrate on your progressive build up from the legs, up the trunk, and exchange the arms. Focus on your controlling the location of the ball more than anything. The night before an appearance, a hot shower, a good night sleep and hydration. The day of your appearance, now is the time for bullpen duty. Get all that preparation the three (3) days before to engage and get cranking. Start your bullpen with stretching and flexibility moves. Usually, bring a towel and place it on the ground and lay on it and do your sit-ups, your pushups, then your shoulder moves like windmills and wrist twists. Why? Because now is when you want any soreness or discomfort to surface. Anything that’s out of the ordinary, shutdown. If all is go - then run through your inventory of pitches and see what’s your best that day, and what’s less so. After an appearance, a hot shower, a rub with liniment like Absorbine Jr and wrap with a hot damp bath towel around the shoulders and pitching arm. Relax and remove the wrap when it cools. Stretch out and relax. I usually asked my staff to take a breather and clear the mind, take a nap for about 30 minutes or so. For the following day after an appearance, a light number of sit-ups, windmills, and light squats. A few miles with a quick paced walk rounds out the day. Plenty of hydration also. I would suggest staying away from the sport’s drinks. Just regular apple juice is nature’s natural sugar, and is a superior beverage for the digestive and urinary track. The second day, simple tossing no more than seventy (70) feet as a distance. Exaggerate your shoulder and arm movements. Keep the strides short of game strides. Take special note of any stiffness that is prolonged and develops into chronic discomfort. The third day, keeping your arm speed down to about 70% of game speed, progressively build up your pitching choreography and run through your pitch inventory. Pay particular attention to the lack of location to the player that your pitching too. When you’re about to reach the third (3rd) day before your pitching, start with the routine that I initially narrated. in #1). With respect to compression clothing, I have no opinion one way other the other. In the professional game, we were restricted on using such appointments. On the other hand, some guys used such arm garments for many reasons during non-game days. However, at your age, and in the amateur leagues of senior ball, I’ve seen many use such garments as you mention. Like you mentioned, it game them support and comfort. Try Absorbine Jr. and any other liniment on a small portion of your arm, just to make sure you don’t have a reaction to it.